The Fargo DTC550 ID card printer is at home whether as a standalone ID card printer or as part of distributed system. With it�s easy cartridge style ribbon and cleaner roller replacement system and intuitive LCD panel, this ID card printer will easily fit in to your work flow. With it�s versatility and ability to grow the Fargo DTC550 ID card printer is a good fit for many industries and applications. With it�s ability to print secure cards and durable cards the Fargo DTC550 ID card printer is a great solution for your growing business. As you grow you will be able to grow the Fargo DTC550 with your business thanks to its modular system. Remove the small plastic cover in the upper left hand corner. Re-Install the small cover and screw and close the cover. Replace the power and refresh the system! We also created a How-To video for the HDP5000 Mag Upgrade. Versatile, flexible, modular, and so much more - the Fargo DTC4000 ID card printer will be able to make an immediate contribution to your ID card needs. 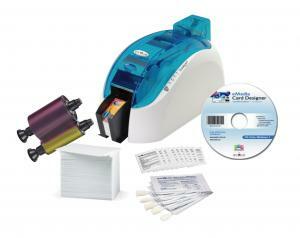 The DTC 1000 ID Card Printer from Fargo has many unique qualities that set it apart from the competition. Built-in Swift ID� badging application software enables you to print ID cards in seconds without having to install any additional software. Economical half-panel ribbons to personalize pre-printed ID cards with a photo and bar code. Industry�s first inline card printing and technology card encoding with one connection using USB or optional Ethernet connectivity. Erase and rewrite eco-friendly feature makes the DTC1000 ideal for temporary ID cards, such as visitor badges. With its small footprint, its compact size was designed for the smallest of desks or tables. With cartridge supplies and easy card reloading, the DTC1000 was made for organizations that need a secure ID card solution without having to commit a lot of room for equipment. How easy is it to start printing ID cards? 2) Choose an ID card printer that fits your specific needs and place an order. 4) Do you need to see how an ID printer works? Check out our free How-To video series. If you manage a health club, sports club, library, or an association you owe it to yourself to provide a membership card. A leisure card identifies members, thanks to graphic personalization. It can also be used for controlling access to various facilities according to a user profile that can be encoded on a chip, a magnetic stripe or bar code. Whether you are a sports club or a cultural association, all your members will identify themselves in a snap thanks to a card that spells sheer professional quality. 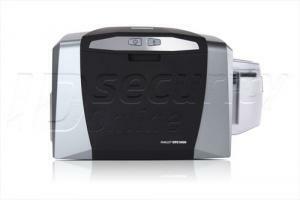 IDSecurityOnline carries a full line of Evolis membership card printers and supplies. Contact us at IDSecurityOnline today at (800) 897 7024 to reorder supplies for your Evolis printer or to discuss your card printing needs. Gone are the days of manually managing visitors through manual sign-in sheets. Using sign-in sheets is too time consuming and insecure. As your security needs grow, visitors also demand highly efficient visitor registration procedures and professional-looking badges. At IDSecurityOnlineOnline we offer a full range of products to help you secure your building and manage visitors. We have a wide array of products from visitor badges and accessories to visitor management software. Visitor and Lobby Management Software can make your company more secure without inconveniencing visitors. A visitor management system can secure your premises and your employees from unwanted guests, while gathering vital information that goes beyond the manual sign-in sheet. The software compares visitor names to a list of barred entrants, flagging any matches or similar names. The software creates a database of visitor photos and demographics, so you can print IDs for repeat visitors instantly. Scan visitor IDs at check-in and checkout to create a log of all visitor activity and eliminate the need for hard-to-read paper logbooks. Whether your a growing small business or a large corporation you could greatly benefit from automating your visitor security and check-in process. If you were worried about dealing with the "Tube" and those big red London buses during the Olympics, have no fear. London is gearing up for the Olympics by making it very easy for anyone to use the transit system with their credit card. Working with the banking Industry (can you say Visa sponsor of the Olympic games) London's transit system will engage a contact-less system usable by anyone with a credit card or other bank card. Much the same as the contact-less systems and cards that we sell at ID Security Online, the subway and buses will have contact-less terminals only taking seconds to pass through. We think this is a great idea but we only wish they had asked us to bid on the job! We believe we could have beat their price! Planning to buy an ID card printer? If you are planning to buy an ID card printer for your company, you will be surprised at the vast array of choices available in the market today. If you are not an ID card printing expert, your head will spin with the number of brands and types that you have to browse through before you can find the perfect choice. But if you equip yourself with sufficient knowledge about buying an ID card printer before you go out to shop for one in the market, it would be easier for you to narrow down your options and make an informed decision. Here are some of the things that you need to think about. In terms of color, there are two kind of ID card printer. One can print full color while the other can only print in monochrome. The advantage of the former is that it produces vibrant images and attractive designs. However, monochrome is quicker and more cost effective. It only takes about 5 seconds per each card and since you�ll only be using a single panel print, the cost is much lower than full color printing. Your choice between the two primarily depends on the nature of your company, budget, and preference. For example, if your company is a web/graphic design or animation company, it makes sense to invest on a full color card printer since the ID should be a reflection of what a company does. Another consideration you have to make is whether you are going to print on the front side or on both sides. As the name implies, the single type printer will print only on the front side of the card. If you are definite that the IDs to be printed for your company will only require print on the front side, this can be the ideal option for you. The dual sided printer, meanwhile, has the advantage of printing on both sides of the ID. Obviously, this one is more expensive than the single side printer. Aside from the more expensive upfront cost, the dual sided ribbon used for this kind of printer is also pricier. You should also ask yourself how many ID cards you plan to be printed each year. If you are a small business, you would only need a few cards a month. But for a larger company, you need to invest on specialized printers that feature high capacity printing of cards. Printer that can accommodate a bigger quantity is more expensive but the investment is worth it. 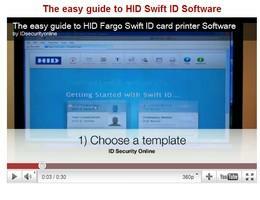 Aside from the printer itself, you should also consider planning your purchase if you intend to buy ID card software. This way, you can be sure that you will be able to make the right buying decision. Entry level ID card software is inexpensive but limited in its capabilities, for instance some software limits the number of data fields per card design. Other software will only allow a limited amount of data records, be aware you may have to up-grade to the next level at additional cost soon after your purchase. If you plan to �network� the software and place it on multiple computers you will have to purchase a higher level of the software plus additional �site licenses� for each additional user. The bottom line is to do your homework but do not hesitate to reach out to an expert in the field, most manufacturers will recommend a �partner� in your area that should ask the appropriate questions I listed above and guide you to the correct choices. Building a new HD studio in NYC. At ID Security Online we listen to our customers and follow through on your requests. We had more requests for �How To� videos and that's why we are creating a video studio in house. By building the studio in house we will have a better opportunity to quickly create the quality videos that best serve our clients. In order to provide you with the best possible HD quality videos we know that we need to get our products in the best possible light. We could shoot with some random office desk lamp, but we know that we could do better. As someone with years of experience working on both sides of the camera, lighting matters as much as sound quality and a steady tripod. This week we have updated our home studio in New York City with new lights and a new system for shooting high quality HD videos. We hope these videos are helpful and make your life easier when getting your ID card printers set up. Feel free to comment on our YouTube page videos and let us know of any videos that you would like to request. One week only Fargo DTC 1000 for only $1349.00! For one week only Idesco is offering its brand new Fargo DTC 1000 for only $1349.00. 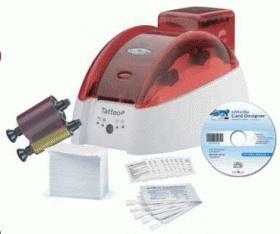 If you need a reason to buy, this is a great single sided ID printer at the lowest cost and only for previous customers. We will also throw in free shipping, 500 ID printer cards, and one printer ribbon. Not enough? Okay, you also get the two year global warranty and setup help directly through our home office. More?! Okay, the first ten customers to order will also get an extra printer ribbon Free. This is a one week only deal on a great Fargo ID Printer for only $1349.00! This is for our valued customers only, please don't send to anyone else. Thank You. The Fargo DTC1000 (direct to card) (Item #47000) single sided printer is a simple and easy to use photo id single sided printer. 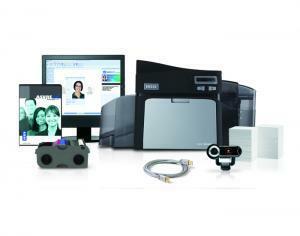 It is ideal for anyone that wants a sleek and virtually maintenance free high quality photo id printer on a budget. The DTC1000 user focus design allows for easy setup, loading and operating for increased efficiency. 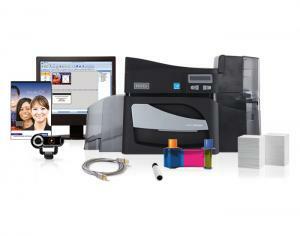 This printer produces sharp professional looking and high quality photo ids. It is a easy to use printer with easy setup and card loading you can have your ids ready in minutes. It prints edge to edge in full color or black and white. For more Info please see our site. A pioneer in the ID card industry, Fargo ID Card Printers work with smart cards, photo ID cards, magnetic stripe cards and proximity cards to establish new standards in dye-sub, inkjet and film-transfer ID card printing. Card printer/encoders, ID systems and ID software and materials, such as ribbons and films and ID accessories, are some of the products Fargo delivers. ID cards have capabilities companies are looking for, such as financial transactions and network access control card-based applications, to help them improve efficiency and enhance security. Fargo Electronics sells its products through distributors and integrators. Fargo ID Card Printers can increase security, set up professional identification and allow you to upgrade from a simple printer to one with more advanced, secure printing features. The products, which are known for their power and modular designs, run from the DTC400 to the advanced HDP5000. For example, the DTC550 Card Printer/Encoder is equipped to encode up to three different smart card technologies in the same pass as card printing and lamination. It also permits centralized or distributed ID card issuance and features an alternative lamination module that makes an extra layer of security available. The Fargo Persona C30e Card Printer/Encoders, which are well-suited for small to midsized companies, offer new improvements available as a free download. Problems such as loading ribbons and cleaning rollers are eliminated with the products easy to load integrated ribbon cartridge. Fargo ID Card Printers customers include universities and colleges, local, state and federal governments, businesses and the health care industry. Columbus State University, Maryland Locksmith Association and Sun Country Airlines improved security and high responsiveness using Fargo printers. Columbus State University selected Fargo ID Card Printers for their ease of use for multiple users and their ability to print debit cards. A few years ago Columbus State University initiated a debit card program for students to help the university reduce administrative costs and simplify business processes. Columbus State University selected the Fargo DTC400, (which it found easy to use), and allows them to add card access to dorms, vending machines and copy machines on campus. The university improved security and productivity and improved student satisfaction with the new Fargo printer. Fargo Electronics, which was acquired by HID Corporation in 2006, develops, manufactures and supplies secure technologies for identity card issuance systems. Founded in 1974, Fargo Electronics is headquartered in Eden Prairie, Minnesota.